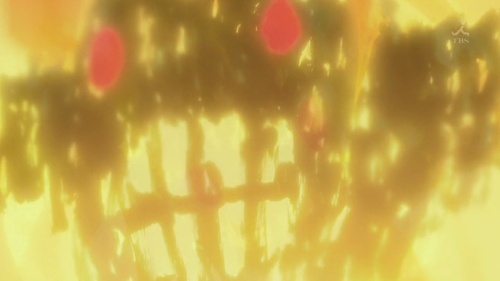 I still read my fair share of blogs and forums, so I had something of an inkling that this episode of Brotherhood was going to be quite special, but even still, I loved it to pieces, and once the credits were finally rolling, all I could think is that this was the exact moment that Brotherhood finally stepped out from its predecessor’s shadow and became great anime in it’s own right. Ah, it’s been a long road. Between the die-hard fans of the manga and lovers of the first series, Brotherhood was always going to face a long and hard battle to win over new admirers, but now there is absolutely no excuse to not be watching this series. I won’t accept it. Episode 19 was perfect. Shounen anime always works best when the plot pairs itself down to the most basic of premises. This episode can be easily described as just a straight up fight between the homunculus Lust and the Flame Alchemist Roy Mustang; it’s that straight forward, everything else rests on how much the anime staff are willing to sacrifice to bring the action to life, and since this is Studio Bones, it was always going to be good. Waves of flame flow like the ocean, bright sparks and the clang of steel claws, the sheer weirdness of what we’re seeing, someone being burnt to a crisp and regenerating time and time again. I say it’s great anime for those reasons. The movement, the music and the action were so good, and because, by and large, I don’t watch anime for plots or characters. For those things, I read books. What I love about anime is watching something like this spark into life. The movement itself is a joy, the use of music and sound, that is anime. If for every dozen of cheap, generic series we can have something like this, it will always be worth being a fan. What most impressed me about this episode was the pacing. The build-up to the climax of the fight was even more tense ans suspenseful than in the manga. In a way, Lust turning into ashes and then blowing away was kind of poignant. The animation of the Lust Vs Roy fight was beautiful. I am sure Arakawa will be pleased since she said it was one of the moments she was most excited to see. I just wish the series kept up this standard. It seems they flip flop when it comes to animation. Some episodes are animated beautifully like this and episode 14. Others like episode 17 and 18 not so much. But I watch anime for the story and style. I think I need a combination of both. And while it is true you can get a good story just be reading a book if I have to give up great animation or a great story. I probably would give up the great animation. Although of course the best anime series should have both. The movement, the music and the action were so good, and because, by and large, I don’t watch anime for plots or characters. For those things, I read books. Well, I don’t subscribe to this notion, so I wasn’t all too impressed by this episode. I mean, it was good for what it was, but it was just another sign to me that FMA isn’t making a concerted effort to separate itself from the bulk of the genre. Style is important in anime, but substance is still king. Anime like Cross Game prove that. I know the anime and manga are not exactly the same thing but I certainly did not fall in love with the FMA storyline in the manga these past 5 years for its style (and no it’s not the fight scenes either although those can be exciting). It was for its well thought out plot, setting, and wonderful characters (both major & minor). I mean was this episode just a fight between Lust & Roy. We also saw Riza break down and almost give up because what she thought happened to Roy. We saw Al not give up on her. We saw Roy’s worry for Havoc. We saw Winry waiting for Al and her happiness at his return. These are the moments that make me love the FMA story. There’s something unique and visceral about a fluid, well-animated fight sequence that I find fascinating. As much as I love a good live action sequence, animation produces some intangible quality that makes it seem much more artistically and aesthetically impressive, in my opinion. I guess it’s just anime’s way of transforming something violent into something beautiful. When it happens like this, it’s wonderful. …Which has been my modus operandi for a few years now! I daren’t even imagine anime like Casshern Sins without the aesthetic. It’s true that not all good anime needs great animation. Cross Game and Monster are fine examples of that, but I suppose my point was that Cross Game and Monster are great stories regardless of medium; I’m not watching them because I’m an anime fan, but rather because I enjoy their stories, so I could read the Cross Game or Monster manga and feel exactly the same way about them, but it’s different with anime like this episode of FMA, or something like Gankutsuou, it’s precisely the way they are animated and presented that makes them so special, when the style becomes the substance and every tiny flicker of detail reveals as much about a character as any amount of dialogue and plot could hope to achieve. I know what you mean, it’s like great animation feels more alive than live action, which seems like a contradictory thing to say, but may be it’s just easier to escape into animation? I understand what you are saying. And you are right the fight scene in this episode was really beautiful. And as a medium animation can capture some things that manga cannot. Action scenes definitely look better animated (at least they should) and this fight was a great example.. But overall I would say the animation of Brotherhood has not added much to the manga scenes. In the first place the FMA manga has a very cinematic feel to it. Hey Paul, it’s me, Lupus from AUKN. Ain’t read your blog in a long time, but I’m glad you’re enjoying new FMA, I remember when he had that argument back in the day about the first anime being bad/good (Well, I thought it was bad after reading the manga, still do, but it’s not terrible). I’ve been keeping up with new FMA, I’m thoroughly enjoying it, but lately I feel it’s been lacking, this is something you may not feel due to never reading the manga, of course. A lot of scenes altered in terms of direction, scenes taken out etc. Regardless it’s still a good watch. Episode 19 has sparked up some decent reception, mostly claiming Mustang to be GAR (Ugh…) after him crushing Lust. Still, this is only the beginning for FMA, there’s much better scenes, this is just one of many, I do hope they’re given the same amount of quality if not better. My god, I love you. After I finished the episode, the first on my mind was to check your blog for an FMA post and you have no idea how much I appreciate the fact that you wrote one. I’ve been dying to see this one chapter animated from manga and it was, in fact, the reason I watched the original FMA series. Though, sadly they left it out. But, my god, I thought the exact same thing after I finished 19: “What I love about anime is watching something like this spark into life. The movement itself is a joy, the use of music and sound, that is anime.” Those two sentences represent, by and large, the meaning of my life. Yes, I have to say, I totally agree with you. It’s style: nothing more than this. I’m a reader of the FMA manga, so I have to say, surely I appreciate its contents (characters, plot, the underlying reflections about the use, or misuse, of science and how the Ishbal war recalls of similar, but way more real, episodes that happen everyday in our world); but after all, why am I watching the anime too? It all comes back to this: things coming finally to life, and giving you unsuspected emotions thanks to the use of music, thanks to good animation, thanks to art. I have to say, it already happened with episode 8 (the fight in Lab n.5), which was quite good, while the fight against Greed was a huge missed chance. But this! 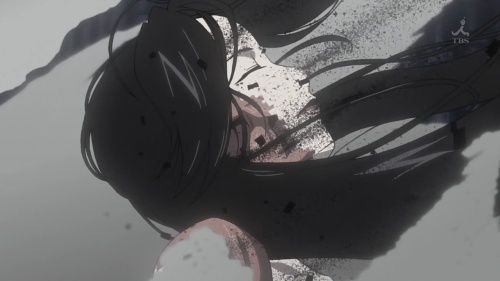 Lust’s death was… well… lustful :). And since this episode, looks like the quality standards aren’t going to drop. It’s really changed course, this anime. It could become one of the best ever. Great posting. I like your weblog, If possible update it more frequently.